Have you seen the latest from Burger King? They call it the French Fry Burger. It's a burger... with french fries on it. Really. Anyway, they're putting the French Fry Burger on their Value Menu, pricing it at $1 so you'll spend your money there. Only, you gotta wonder who comes up with these ideas. 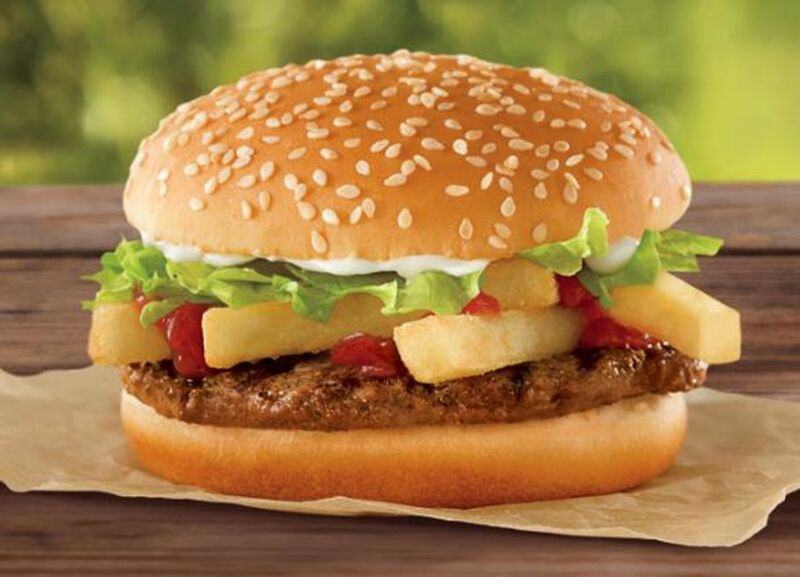 Take a four-year-old to Burger King, buy him a small burger meal, and there's a chance he'll lift up the bun and put some french fries on the burger. So, in their latest salvo in the Burger Wars, Burger King is breaking out a strategy that a four-year-old would come up with. I'm thinking that the wrong restaurant chain has a clown as a mascot. This is a crime against Solanum tuberosum. If you order that do they still ask "would you like fries with that?" and if you answer "no" do you get a plain burger? "Have It Your Way, Which We've Just Caught Onto." The idea is that you get at least a taste of fries without having to spend an extra $1.29. I, for one, think this is brilliant - I never want more than a few fries anyway, because once they are no longer very, very hot they are not very good. I just spent a ton of money keeping my truck on the road, and money will be scarce for the next few months - I am totally getting one of these. Burger and fries for a buck - I love capitalism. For those of us too fat and lazy to pick up a fry. Problem solved. Ever since they removed the lard from the fry-a-lator, fries have not been good anyway, so why would I want a nasty fry on my burger? So. Nobody's going to admit they had to look-up "Solanum tuberosum." Pffft. @6 - I recognized "tuber", so I just assumed it was genus & species of some sort of potato. My son has been doing this for years. You mean he was onto something?